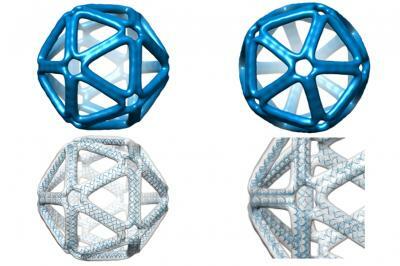 Researchers can build complex, nanometer-scale structures of almost any shape and form, using strands of DNA. But these particles must be designed by hand, in a complex and laborious process. This has limited the technique, known as DNA origami, to just a small group of experts in the field. "The paper turns the problem around from one in which an expert designs the DNA needed to synthesize the object, to one in which the object itself is the starting point, with the DNA sequences that are needed automatically defined by the algorithm," Bathe says. "Our hope is that this automation significantly broadens participation of others in the use of this powerful molecular design paradigm." "That [step] is a powerful part of the algorithm, because it does not require any manual or human interface, and it is guaranteed to work for any 3-D object very efficiently," he says. The algorithm, which is known as DAEDALUS (DNA Origami Sequence Design Algorithm for User-defined Structures) after the Greek craftsman and artist who designed labyrinths that resemble origami's complex scaffold structures, can build any type of 3-D shape, provided it has a closed surface. This can include shapes with one or more holes, such as a torus. 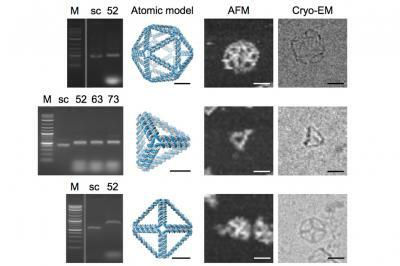 The team's strategy in designing and synthesizing the DNA nanoparticles was also validated using 3-D cryo-electron microscopy reconstructions by Bathe's collaborator, Wah Chiu at Baylor College of Medicine. The surface of the nanoparticles could be designed with any combination of peptides and proteins, located at any desired location on the structure, in order to mimic the way in which a virus appears to the body's immune system. The team is also investigating the use of the nanoparticles as DNA memory blocks. Previous research has shown that information can be stored in DNA, in a similar way to the 0s and 1s used to store data digitally. The information to be stored is "written" using DNA synthesis and can then be read back using DNA sequencing technology. Using the DNA nanoparticles would allow this information to be stored in a structured and protected way, with each particle akin to a page or chapter of a book. Recalling a particular chapter or book would then be as simple as reading that nanoparticle's identity, somewhat like using library index cards, Bathe says.